While I love to cook, I cannot bake. When I say I cannot bake, I mean I really cannot bake, not even cookies you drop onto a tray. This has been an issue all of my life and whenever I get up the courage to try again, I always end up with cookies that are either still raw or very crunchy (my husband kindly refers to them as “cookie crackers”). At first I thought it was the oven but when my mother came to visit she was able to bake cookies just fine. I think it’s just me and I am fine with that. I tell you this because while “everyone” else was baking and decorating Christmas cookies with their children, we didn’t do that in our house. Now, I don’t beat myself up too badly because I am pretty sure that even if I did bake cookies, Andrew would have very little interest in helping me decorate for more than a minute. What I feel strongly about is giving him the same opportunities as other children, I just have to structure it differently. I knew that if I created a cookie decorating station as part of My Obstacle Course, he’d only have to engage in this for a short time but would still get the chance to experience this holiday activity. Since I don’t bake, I don’t have a lot of baking tools so while I was at our grocery store I purchased a fairly inexpensive cake decorating kit with different tips on it (I think it was $2.99), some holiday shaped cookie cutters and some whipped frosting. I decided not to get actual cookies to decorate (which you could) but figured I could have him use the cookie cutters instead. The cookie cutters provide a specific place to put the frosting so he doesn’t have to worry about it looking one way or another and the task was specific – “Fill the cookie cutter with frosting.” I placed a cookie sheet underneath the cookie cutters to create an easy to clean work surface but you could go one step further and use either a piece of waxed or parchment paper or a paper plate. 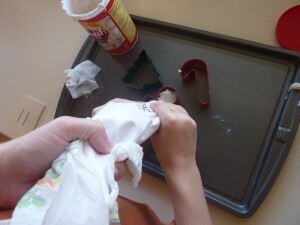 Once I got thinking about this I realized that in addition to getting the chance to use a different kind of tool, he was also going to be working through some sensory discomfort (frosting on hands/fingers and the sweet smell of the frosting) while working on fine motor skills (squeezing the plastic bag so the frosting comes out) and planning (moving his hands back to the top, squeezing the frosting back down when the bottom was empty). 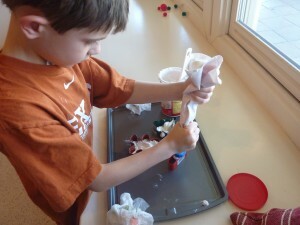 Anytime I can find an activity that targets lots of different skills like this I am thrilled!! This was a very easy station to set up (the photograph above shows exactly what it looked like when we did it last week) and all I had to do was gather the materials. I used the spatula to help scoop the frosting into the cake decorating bag and got some damp paper towels ready for him to wipe his hands when necessary. He was very curious about this station and I first showed him how it worked, what to do and did some hand over hand to give him an idea of the amount of pressure needed to squeeze frosting out into the cookie cutter. After that it was trial and error to figure out the best way to do it. 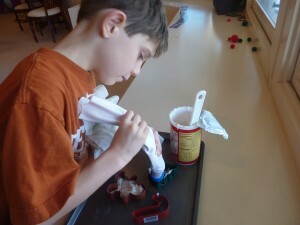 I am holding the top at first while he figures out how to squeeze the frosting to fill the inside of the cookie cutter. He's not quite got it yet. His fingers are still sitting lightly on the bag, using very little pressure. I showed him how to squeeze with his fingers to get more frosting out of the bag. Now he's got the hang of it! Note the change in hand position and the squeezed fists- great fine motor work!! Also note the wet paper towels nearby to help with the sticky frosting. He is taking this task very seriously. 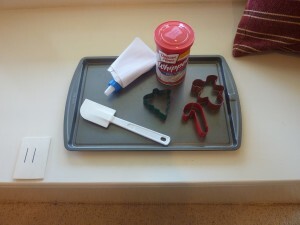 It is something that has a beginning, an end and he knows what the expectation is - fill those three cookie cutters. Change the tips of the decorator to compare and contrast them. Use the decorator to make shapes, different kinds of lines (straight, wavy, horizontal, vertical, etc. ), letters or numbers with the frosting. Just A Thought: There are many things that we do that are a little bit different from other people and that is okay. I always say, our normal is different from other people’s normal and when you think about it, everyone’s normal is different and that’s what keeps things interesting!! Embrace your own normal today 🙂 !